The operatives of the Intelligence Response Team led by a Deputy Commissioner of Police, Abba Kyari, have arrested more suspects in connection with the April 5 Offa bank robberies during which nine policemen and 33 persons were killed. Kwarareporters gathers that on Wednesday in Abuja the additional suspects were apprehended in Kwara, Oyo and Kogi states and were assisting the police to track down other accomplices. A source, who declined to give the number of the suspects, explained that two AK 47 rifles were also recovered from them. The fresh suspects, it was learnt, would soon be brought to Abuja and paraded before the media . Meanwhile, the Senate President, Bukola Saraki, has denied any link to the five gang leaders that were involved in the bank robberies. A source explained that the former Kwara State Governor, in his response submitted to the police last Thursday, stated that as a politician, he had a large following and could not possibly know all his supporters. The police had said that their investigation into the matter showed that all the five gang leaders, namely: Akinnibosun, Ibikunle Ogunleye, Adeola Abraham, Salawudeen Azeez and Niyi Ogundiran, have direct connections to the Senate President. The force stated that the suspected gangsters were at Saraki daughter’s wedding and also went with him to visit the Olofa of Offa, when he paid the traditional ruler a condolence visit in the aftermath of the robberies. It also explained that one of the five gang leaders, Abraham, was wearing the ‘Aso Ebi’ used during the Senate President’s daughter’s wedding, indicating that he was close to the politician. A National Assembly source described Saraki’s statement as mature, noting that he denied procuring firearms for the robbery suspects and omitted the Lexus SUV he donated to the gang leader, Ayoade Akinnibosun, a.k.a AY. “He actually denied knowing the gang members; he insisted that as a politician, he has a large following and could not know many of them. He also defended the allegation that he purchased arms for the gang, but he was silent on the SUV he gave to Akinnibosun through the Chief of Staff to Kwara State Governor, Yusuf Abdulwahab,” the source stated. It was learnt that the letter was receiving the necessary attention, but it could not be established whether the police authorities would still insist on the Senate President’s appearance before investigators in spite of his written defence. 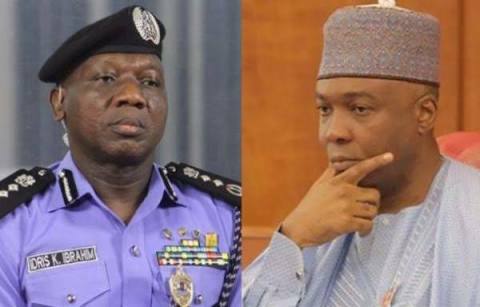 The police spokesman, Jimoh Moshood, had insisted at a press conference that Saraki must report to the Force Intelligence Response Team’s office at Guzape, Abuja, for interrogation on his links to the five gang leaders. Moshood could not be reached for comment as he did not respond to calls and a text message, but police sources stated that Saraki's claims would be verified by investigators, noting that his defence had not foreclosed his connection or link to the gang leader.